Flamenco dancer Michiyo Ando’s lessons provide seniors with mental stimulation and fun. “What are these?” Looking at a pair of shell-shaped pieces of wood, joined on one edge by a string, Katsuko Elegino asked with a mystified look. “These are percussion musical instruments, called castanets. Tie the string around your thumb, hold them in your hands, and tap with your fingers to make sounds,” Michiyo Ando, a Japanese flamenco dancer, answered. 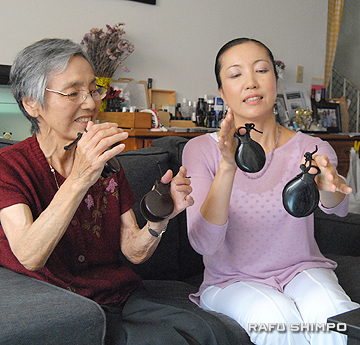 Michiyo Ando, right, teaches Katsuko Elegino, who is diagnosed with Alzheimer’s disease, how to play castanets. Katsuko carefully examined Michiyo’s demonstration and tapped the castanets with her fingers. As soon as she heard the loud, dry, high-pitched, exciting sound of castanets, the deeper lines drawn between her eyebrows disappeared. “Did I do it right?” She had a big grin on her face. It was about seven years ago when Katsuko was diagnosed with Alzheimer’s disease. Over the years, her symptoms have progressed from minor concerns like repeating herself to severe disorientation, such as being unable to find her way home after a brief walk in her neighborhood. Dealing with the loss of memories, Katsuko felt confused, uneasy, and anxious. Family members have noticed that she rarely smiles now since her diagnosis. Hoping it would give her a chance to have some fun, the Eleginos asked Michiyo to give her castanet lessons. Michiyo, who teaches flamenco to the general public, also has experience teaching castanets to seniors with Alzheimer’s disease. She has witnessed the positive impact that the power of music has on this population in terms of comfort, healing, and fun. “Castanets are simple instruments to play by just tapping. Depending on the clients’ age, physical capacity, and musical ability, it is easy to adjust the level. Using all of your fingers to play is also a good exercise,” Michiyo explained. Her top priority is to teach to the clients’ abilities, making the most of what they have left. “People suffering from Alzheimer’s oftentimes feel insecure about themselves due to their diminishing independence and fading memories. Realizing what they can do brings them confidence and joy. That means a lot to them,” Michiyo said. 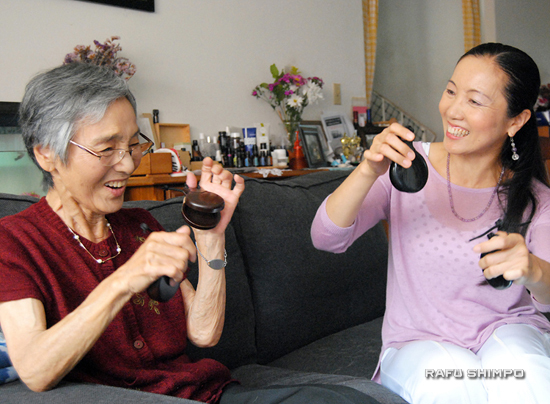 Katsuko’s daughter-in-law, Jinko, noticed that her mother-in-law lights up with a beautiful smile during her castanet sessions with Michiyo. “We as family members are conditioned to have a negative response to her behaviors every time she does something ‘wrong,’ but a third person can see her positive sides,” Jinko said. Michiyo understands the frustration that the family members have been enduring. Her mother, who lives in Kumamoto Prefecture, has also been suffering from Alzheimer’s disease for the past four years. “Family members who give care every day tend to focus too much on diminishing abilities. So as an outsider, I’d like to emphasize to them what Katsuko still can do through music,” said Michiyo. A week later, Katsuko begins her next session by asking the same question she’d pondered before: “What are these?” “These are percussion musical instruments, called castanets…,” Michiyo explains as if it were the first time. Seeing flamenco castanets makes people happy, gives them confidence and joy. 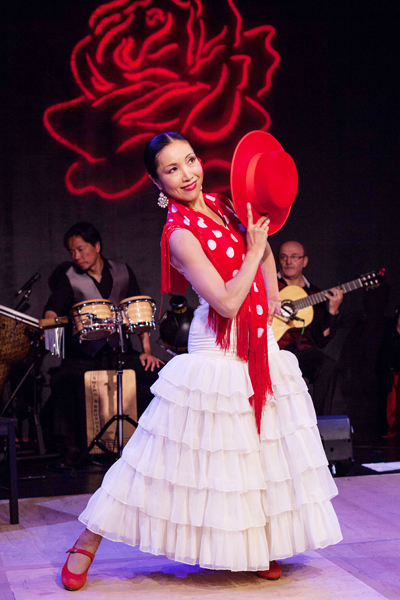 “I’m so grateful that my beloved flamenco can also be valuable to others in a different way,” said Michiyo. “Flamenco requires dancers to express and expose deeper inner emotions, which is difficult, especially for Japanese people who grew up appearing stoic. But once you break the wall, all the creativity that you’ve hidden starts to overflow and expand your mind,” said Michiyo, also known as Mikaela Kai. Fourteen years ago, she fell in love with flamenco. It took five years for her to be able to comfortably express her emotions through one of the most passionate dances, but now she is fascinated by the rich expressive possibilities this art form offers her. When she was in her 20s, she flew to Spain many times on business and enjoyed watching flamenco performances in Madrid and Barcelona. She even studied Spanish history and language, but for some reason, the thought of learning flamenco never crossed her mind. Ten years passed. After moving to Los Angeles, one of her friends invited her to join a belly dancing class. There, she heard familiar music, rhythms, and steps from the classroom next door — it was flamenco. It all resonated with her. Ever since, she has received professional lessons from Yolanda Arroyo, one of the best-known flamenco dancers in Los Angeles. Her love of flamenco grows deeper every time she performs. Her next performance will be with Arroyo and others on Sunday, Oct. 19, from 3 to 4:30 p.m. at the Electric Lodge Performing Arts Center, 1416 Electric Ave. in Venice. Admission is $23 in advance, $25 at the door. For tickets, contact Corina del Sol by phone at (310) 827-5908 or by email or click here to purchase online. Michiyo’s castanet sessions start from $20 for 20 minutes at her Gardena studio, 16418 S. Western Ave., Unit A. House calls can be arranged. She also teaches flamenco dance classes to all ages. For more info, call (310) 874-3363, email or visit her website.